» Education » What will learning look like this year? What will learning look like this year? I’ve been reading through the report, Supporting future-oriented learning and teaching – a New Zealand perspective by Bolstad et al (2012). I actually thought I’d already read this report but it turns out I’d only read the executive summary and skimmed through it. There is a lot of good stuff in here! One of the things that stood out to me was in Table 3, entitled What we know about learning (p 15). We are aware that learning has and is changing. It’s no longer just about consuming information/knowledge that is fed to us by an expert in that area. There is much more to it than that (and probably always has been to some degree but our model of school has been like this). It’s almost cliche now. The industrial model of education is so last century! However, it’s so easy to fall back on this tried and true method of imparting knowledge, particularly when things aren’t working well, or time is getting tight (eg. close to exams). 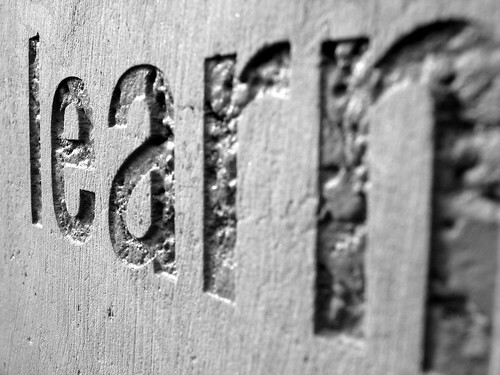 Learning is much more than simply adding new concepts (or knowledge) to one’s existing repertoire. Experiences are critical to learning. Learners need to develop in-depth knowledge in some areas if they are to go on learning. To learn, people need to be actively engaged—they need to be doing something, thinking something and/or saying something that requires them to actively process, interpret and adapt an experience to a new context or use. Learners have to want to learn the material. Learning has to be a personalised experience. Learning needs to take place in a wide variety of settings. Intelligence—or intellectual capacity—is not fixed, but is expandable (through the right kinds of experiences). Being the beginning of a (school) year, I’m finding it a good chance to consider what learning will look like this year for me and for those I’m working alongside, whether they be children or adults. A lot of my own learning takes place on line through reading blog posts or articles. I’m not a big reader so I find it quite difficult at times to focus and find I drift off (occasionallly to sleep!). So one thing I need to work on this year is ensureing that my learning involves thinking. That I stop after a section or chapter and think back and reflect on what it said and how it might relate to me and my work. This highlights the second and fifth points in the list above. Even thinking about this now, I realise that when I’m learning for me I’m not always engaged! How much more is this likely if I’m pushing things on to my learners! Thinking about my learners (who are mostly adults), how will I ensure I’m doing the best job for them? I will I know that learners what to learn the material? One way is to ensure they have a voice into what they are learning. Adult learners in particular need to be involved in deciding what they learn as they don’t like things forced on to them (this is not to say we should do it to children!). By working alongside side the learners to help them to voice their needs appropriately, ensuring that they have a voice in to any learning that I’m involved with, I can support them with learning that is relevant, useful and desired by them. These are very much just my initial thoughts. I’m continuing to reflect on this list and what it means to learning in 2015. I wonder what learning will look like for you and your students this year? Bolstad, R., Gilbert, J., McDowall, S., Bull, A., Boyd, S., & Hipkins, R. (2012). Supporting Future-oriented Learning & Teaching: A New Zealand Perspective. Ministry of Education. Education 2015, future-oriented learning, learning, weeklyedpost Bookmark the permalink.